To begin, we read the book Emily's Tiger which is a sweet, multi-generational story about how a grandmother helps her granddaughter relax to handle her outbursts and frustrations. You can learn more about this adorable book and order it here. After reading, the families learned a simple word we to remember when feelings of anger or frustration begin to bubble up: STaRT. STaRT stands for: Stop, Take A deep breath, Relax, and Twist. We learned several twisting yoga poses because twisting creates more space in the body. This space allows our breath and our energy to flow better to give us an emotional lift. Twisting also allows us to look in different directions. When we see the world from different angles and perspectives, we can often get a different perspective on whatever is making us mad or upset. One of the twisting poses we practiced was the reclined belly twist. This is a great one to practice after you STOP, TAKE A DEEP BREATH, and RELAX! After some twisting yoga, we practiced a combination deep breathing and art activity called FIST SQUEEZE ART. With a sheet of paper in our hands we made tight fists, putting all of our energy tightly into our hands (and the paper). Then we took a deep breath, and when we exhaled, we unclenched our fists and relaxed. Next, we took the crumpled paper and opened it up, noticing all of its bumps and crinkles. We talked about how all of the fist-squeezing energy just went into that piece of paper and how, when we're feeling really angry, we can do this exercise to transfer the mad energy from our bodies into the paper. We then took some time to turn our crumpled paper into something beautiful. Each child colored in the shapes, lines, and squiggles that were made on the paper. Kids were encouraged to make their paper look however they wanted: some used bright and cheerful colors, others created realistic drawings, and some made designs that made them feel calm and peaceful. It was a great way to learn how to turn red-hot energy into calm and creative energy. If you missed this fun and helpful class and want to learn more ways to use yoga to handle big emotions, email me at lindsay@lindsaybayer.net. I'm happy to share more poses, activities, and resources for your home or classroom. And don't forget to sign up for our next FREE family yoga class celebrating Cinco De Mayo! Click here for all the details and to register. Poses for Creativity and SO MUCH More! Reminds children that they can open themselves up to try new things. Helpful to practice when kids are reluctant to try something new. This pose increases the flow of oxygen to the brain and energizes the mind and body. Being upside down also allows kids to see the world in a different way, which helps them get a new perspective on a situation. Helpful to practice when kids are feeling "stuck" and need new ideas. The twisting motion is naturally calming and soothing to kids. Perfect to try when kids get frustrated or need some redirection. They can also SLOWLY spin in a circle for the same effect. This pose inspires strength and confidence. Helpful to practice when kids need a self-esteem boost. This pose allows adults to show children support and encouragement. Good to try when kids ask for your help or if they're feeling alone. If you missed CREATIVITY YOGA & STORY TIME, there's an easy way to get your hands on the class lesson plan to do it right at home! 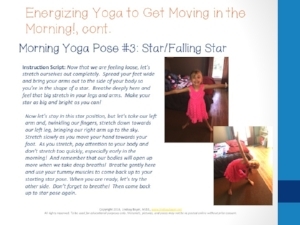 Click here to get the CREATIVITY YOGA & STORY TIME LESSON PLAN! It includes all class components: warm-up activity, poses instructions, process artwork game instructions/printables, materials list, book recommendations, and a soothing final relaxation! This plan and many more are available at the lindsaybayerdotnet store so even if you miss a class, you can bring it right into your own home! We had so many awesome super-kids in our August SUPERHERO Yoga & Story Time classes. We learned the rules of being a superhero, like helping others and overcoming obstacles, and even made our own superhero shields! But the best part (in my opinion) was teaching sun salutations with a superhero twist! Look up to the sky to check for villains. Reach your arms up over your head, bringing your palms together. Look down to check on the city. Swan dive your arms down as you bend from the waist and place your hands on your shins or on the floor in forward fold. You see a villain! Stretch out and fly! Place your hands on the floor and step back into plank pose. Swoop to chase the villain. Bend your elbows to slowly bring your body to the floor, then lift your upper body with your arms in cobra pose. Put the villain in a trap. Curl your toes under and bring your hips up high into the sky in downward-facing dog; you will look like an upside-down V.
Walk the villain to the police station. Take small slow steps to bring your feet to your hands, ending up in another forward fold. Relax, knowing the city is safe. Stand up slowly, bringing your hands to your heart in prayer position. The class was so much fun. If you missed it, we've got more fun planned in September at NATURE Yoga & Story Time. Click here for more information and to register! 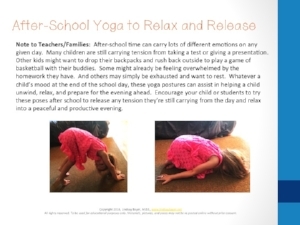 'Back to School Yoga Plan for Families and Educators' Available Now! A new school year is an exciting time with buying school supplies, meeting new teachers, and reuniting with friends. But this time of year can often lead to several other experiences for students: hitting the snooze button one too many times, running late, trudging through the morning with little energy, getting jittery before a pop quiz, feeling overwhelmed by homework, and not getting restful sleep. Uggg. Each component of this plan includes step-by-step pose instructions and scripts so you'll know exactly what to say to instruct your children or students. There are even actual photos (of my own sweet little girl) to help you out as well. You'll get this complete 27-page comprehensive lesson plan for only $4.50! This gives you the ability to download the plan, so you can return to it again and again. I can't wait to hear stories of happy mornings, calm after-school times, and peaceful nights of sleep during the 2017-18 school year! Zoo Yoga Recap and the Yoga & Story Time "Caring Journal"
Thanks to all the families that attended our July Yoga & Story Time classes all about the ZOO! We focused a lot on moving like zoo animals (of course, it’s a zoo yoga class, right?! ), but we also focused a lot on compassion. The book we read was A Sick Day for Amos McGee by Philip and Erin Stead. Amos goes to the city zoo on the 6am bus every morning to care for his animal friends. But when Amos is sick, the tables turn and it’s the animals’ turn to care for him. I love this book because of its beautiful illustrations (illustrator Erin Stead received a Caldecott Medal for this book) and its beautiful message: that true friends take care of each other. 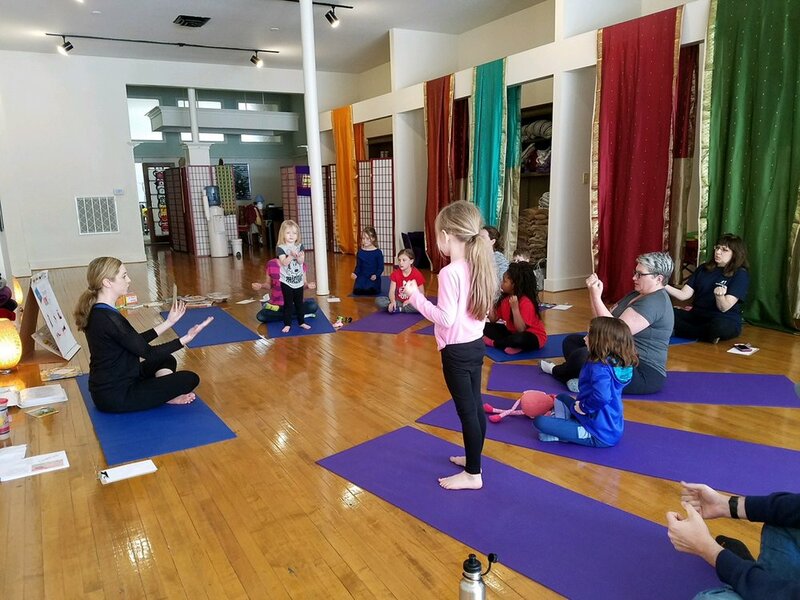 I love these responses because they reinforce some of the main objectives of all Yoga & Story Time classes: that children will learn the importance of self-care (through active play, deep breathing, and relaxation) and how to care for their families and caregivers (through activities that promote bonding, cooperation, and trust). All of the responses we received in our classes will be compiled in a “Caring Journal” that will travel with me to all future Yoga & Story Time classes. The next time you come to class, take a look at the journal and discuss the different ways your child can show care and compassion for themselves and others. You can view the “Caring Journal” at our next Yoga & Story Time sessions in August, which are all about SUPERHEROS! We will learn a yoga sequence that will help us have super strength, super balance, and super power! Click on the sessions below to get more information and register! Cut your streamers or ribbon into foot-long strips. 5-6 strips should be plenty. Using the scotch tape, affix the streamers or ribbon to the lower back of the paper plate along the edge you cut. Attach them side-by-side to make the jellyfish tentacles. Flip the plate over and attach the googly eyes or draw on eyes with a marker. Use the marker to make any other facial features you’d like. We made smiles, eyebrows, and even glasses! Holding your jellyfish in front of your face, take a deep breath in through your nose. As you blow out through your mouth, see if you can make the tentacles dance with the breeze you’re creating. Try to make them sway very gently with your nice, deep, strong breath. We had a great time creating our jellyfish and an even better time making them sway with our deep breathing. Next month, Yoga & Story Time is all about THE ZOO! We will move our bodies, use our imaginations, and even practice making zoo animal sounds! 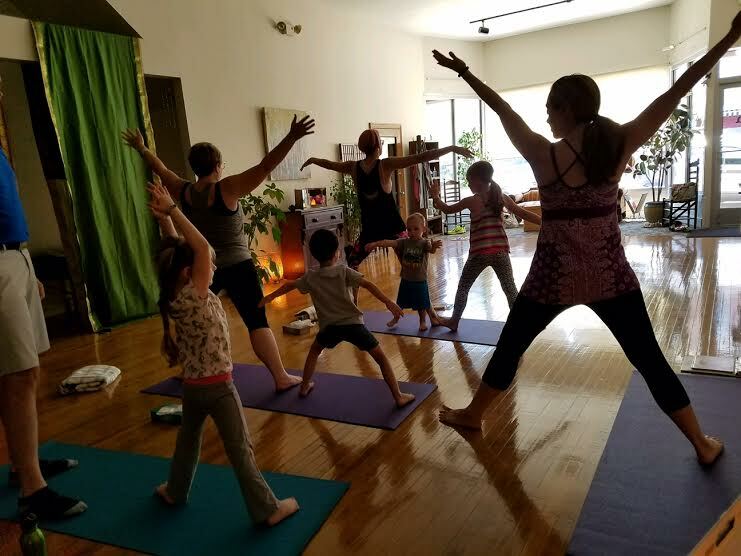 ZOO YOGA & STORY TIME will be on July 29th at 1pm at YOGA HAPPENS HERE in Pekin and on July 31st at 10am and 5:30 pm at THE PATH CENTER FOR HEALING in Galesburg. Contact me to pre-register for this class that’s sure to have us moving and laughing! The Bio-Mat. It truly is a magical thing. I’ve known this for a long time because when my husband and I went out to Colorado to visit his aunt and stay at her home/yoga studio in 2011, I practically spent every available moment on the thing. We enjoyed our experience using the Bio-Mat so much that we bought one for ourselves not even two months later. Simple, right? All I know is that using the Bio-Mat makes me feel goooooood. The morning after my fight with my pants, I decided to do some yoga to try to work out my hammy a bit more. But I made one slight change. Instead of rolling out my regular yoga mat, I flipped the switch on our Bio-Mat and rolled it out directly on the floor. I started on my feet with warm-ups and standing poses before going into some modified flows when the mat was really warmed up. And I’m telling you, after 30 minutes of a slow and steady yoga practice on the Bio-Mat at the highest heat setting: pain…nearly gone. Range of motion…a bazillion percent better (that’s a real statistic, right?). Soreness the rest of the day…barely noticeable. This is after ONE mini session on this thing! I’ve since done my yoga practice a couple times per week directly on the Bio-Mat and my hamstring is back to normal. Not only does Bio-Mat yoga help me with pre-existing discomforts, but it helps me deepen various postures and assists with post-session relaxation and integration. I really wish I’d been doing this for years as I think back to all the minor pains and discomforts I’ve had to overcome without the Bio-Mat’s assistance. While my hamstring injury wasn’t severe (and I’m certainly not claiming it will cure you of all that ails you), I do believe my leg would have hurt a heck of a lot longer without the Bio-Mat. And my husband loves the thing as much as I do. While he hasn’t had to use it to recuperate from an injury, he does use it to recuperate from the everyday stress of people being jerks at the grocery store or having to wait 15 minutes in his car for a passing train. So our usual evening routine is one of us puts our daughter to bed, the other uses the Bio-Mat…then we switch the next night. Now…why am I telling you all of this? Well, for one, you can go out and buy yourself your own personal Bio-Mat (or just learn more about them) by contacting Paula at YOGA HAPPENS HERE in Pekin (paula@yogahappenshere.com). BUT, if you’re a student (or a prospective student) of YOGA HAPPENS HERE, you actually have a Bio-Mat available to you! Paula offers Bio-Mat relaxation for one student on a rotating basis during her regular yoga classes AND she also offers private Bio-Mat sessions during non-class hours. A private 25 min. Bio-Mat session is only $15! I know many of Paula’s students are Bio-Mat believers as I am, so contact her for a session to see what all the hoopla is really about: paula@yogahappenshere.com or 309-282-6112. Food Yoga Recap and Rice Jar Giveaway! It's really fun rocking and rolling when transitioning from Strawberry to Bear...try it! We also worked with partners to share, imagined the delight of eating something very yummy (which we demonstrated by basically giving ourselves great big hugs! ), and relaxed as the book ended. We read the book at the beginning of class, then again after learning the poses so we could practice each posture as it was mentioned in the story. Everyone was REALLY into the book! Our yoga game was also very fun. I made some rice jars with tiny charms hidden inside. Each child/adult team had to find the hidden charms (which were shaped like tiny strawberries, knives, mice, etc.) in the sea of rice, then perform the pose that corresponded with the charm. It took lots of patience, concentration, perseverance, and a good memory to find all the items, but I think all our teams completed the challenge! I actually have 6 FOOD YOGA RICE JARS available for anyone who wants them! If you missed the class and want to try this game OR if you would like to practice this game again at home, simply CONTACT ME and I'll give a jar to you! If you're a regular, I'll pass on a jar to you at our next class. If you need it sent to you, I may ask for a small fee just to cover shipping. Happy reading and happy moving! I'm sure you've seen tutorials for DIY calming jars and glitter bottles floating around Pinterest. I've made these for Stella since she was a baby and, after a particularly long day, I find myself shaking them up and watching the glitter fall right alongside her. They really are relaxing! So when I stumbled upon this tutorial for DIY Nebula Jars, I knew I wanted to incorporate something like this to use during SPACE YOGA. So, after a few modifications, Stella and I came up with our own variation at the kitchen sink yesterday: CALMING GALAXY BOTTLES. And…if you want a sneak peek of the book we're reading for our SPACE class, take a gander at SPACE BOY by Leo Landry. This post may contain affiliate links, but I only link to products I recommend and have tried/used myself. 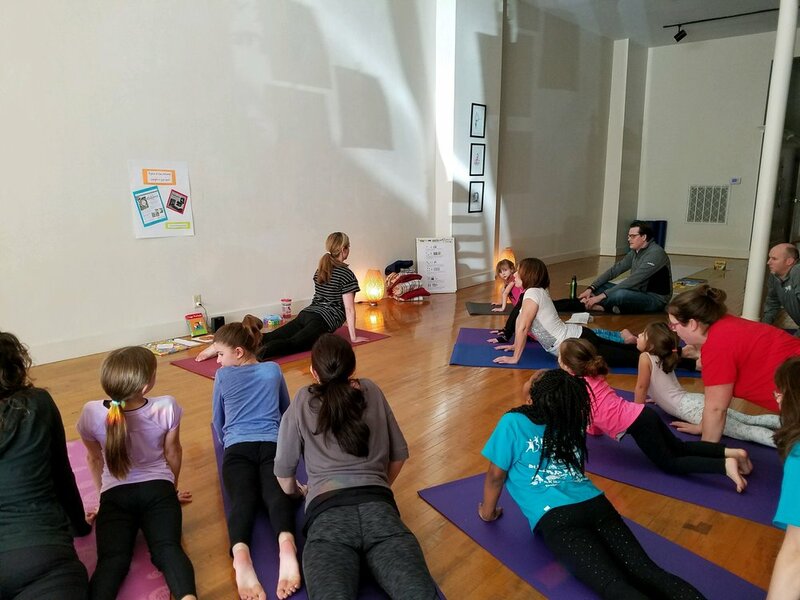 I've had SO MANY people ask me if I would ever do an evening Yoga & Story Time class in Galesburg for working families. I totally understand this request and never meant to exclude working families when we started Y&ST at The Path. In fact, it was BECAUSE I'm a working parent myself that I couldn't readily accommodate this request. My schedule with writing, consulting projects, teaching, mom-ing and wife-ing only gave me a slim window to teach in Galesburg (which just happened to be monthly on Monday mornings). But I have some work projects that are winding down and feel that I can now commit to holding monthly evening sessions as well! The evening classes will be on the same day and same location (the beautiful Path Center for Healing) at 5:30pm. I've also had multiple people ask about age recommendations for Y&ST classes. I initially developed these classes for preschool-aged children because, well, I'm the mom of a preschooler. But I've done yoga with Stella since she was a wee babe and I'm certified to teach yoga to prenatal moms, children, and teens. I've also had classes with children of many different ages in Pekin. I think I once had a 10-month-old and a 10-year-old in the same class. And guess what? They both enjoyed it! Because I think children of all stages of development could benefit from Y&ST, we are opening the classes to children of all ages. I will offer age-appropriate modifications depending on your child's age and abilities. While the classes probably wouldn't be great for infants or pre-crawlers (due to the amount of activity), toddlers, preschoolers, and school-age children should find Y&ST to be a blast! Our first evening Y&ST class will be March 27 at 5:30pm. Of course you can also register for the same day at 10am. Click here for more info on those classes. I hope to see you and your child soon for some yoga fun! After I receive your email, I will send you a link to provide your payment. Once payment is processed I will email your certificates. They can be redeemed at either Yoga Happens Here or The Path Center for Healing for any 2017 classes. I'm only offering this special through the end of the month, so don't delay to save on your 2017 classes! $20 Gift Cards for $15 through 12/31/16! I’m working on a lesson for May’s Story Time Yoga class based on the book Bridget’s Beret by Tom Lichtenheld. This book has been on my children’s book to-read list for a long time, but I just picked it up at our library this week. The story follows Bridget, a talented little artist. Bridget is certain that her artistic prowess comes from the power of her beret…the kind that ALL great artists wear! But when Bridget’s beret flies away in a gust of wind, she is unsure if she will ever be able to create a work of art again. I thought the topics of anxiety and regaining inspiration would lend themselves well to a child and family yoga class. At our May session we will read this book and learn anti-anxiety postures that will benefit children AND adults. We will also create a special masterpiece of our own, so be sure to register for the class if you’re in the area! Easy Seated Pose – This pose calms by creating stillness in both the mind and body. This is a great posture to come into for deep breathing. Its very name (EASY) is a signal to trigger relaxation and calm. Down Dog – This is a great anti-anxiety pose because it encourages the flow of oxygen and nutrients to the brain. Down Dog enhances focus and concentration and combats fatigue. Plank Pose – This posture tones all of the body’s core muscles and is very energizing. This engagement of the body is beneficial to fight the blues or sluggishness. *This post contains affiliate links, but I only recommend and link products that I’ve used and love myself! In my last post on creativity, I discussed the concept of “creative alterations.” Making even minor modifications to instructions (like adding an ingredient to a recipe) can get the creative juices flowing. This week, after taking Stella to art class, I started thinking of creative alterations that would help spark the creativity of kids. In her class, Stella was given the choice of painting with either a wooden stick or a paintbrush. But she asked her teacher, “Can I use my hands instead?” The teacher thought this was a great idea and I was so proud that Stella was brave enough to ask this question. Just this minor alteration allowed Stella to experiment more with her art project and to feel the textures she was working with. This was a simple alteration, but certainly a creative one too. 6. Mixing party themes – This happened to us recently. Stella wanted a football AND tutu birthday party…so we came up with a “Touchdowns and Tutus” party! Try modifing your child’s activities by making one of these minor creative alterations. These minor changes can add big fun to your day and also spark some creative thinking as well.